Minimum quantity for "Ayam Thai Satay Sauce - Mild" is 1. For years, people throughout Asia have enjoyed the delicious combination of peanuts, chilleds and spices that make a satay sauce. 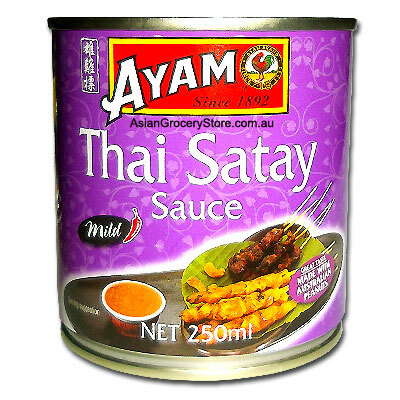 Part of the complete range of AYAM Satay Sauce. Thai Satay Sauce highlights the tranditional flavours of Thailand - lemongrass, galangal and tamarind. Water, Australian peanuts (20%), Sugar, Onion, Lemongrass stems, fish Sauce (Fish extract, water, salt), coconut cream powder (coconut cream, extract, maltodexxtrin, milk protein), soya bean oil, galangal, tanarind, chilli, garlic, chilli powder.